The Korean Peninsula is undergoing a potentially momentous transition with a flurry of bilateral summit diplomacy between all actors. But with North Korea’s real intentions for denuclearization remaining uncertain, there are simultaneously hopes and fears for the future progress of détente. Through its involvement in nuclear safety, energy assistance, facilitating dialogue, and provision of humanitarian aid, the EU and its member states have a long track record of constructive engagement with North Korea. 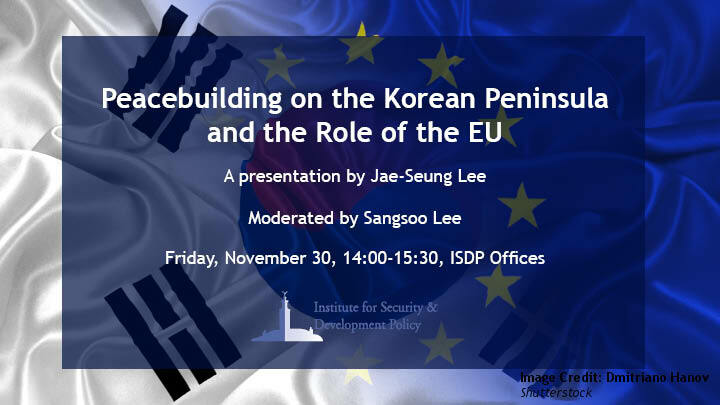 This lecture by Prof. Jae-Seung Lee, Jean Monnet Chair at Korea University, will address the contrasting views of the ongoing developments on the Peninsula as well as explore the potential role of the EU in peacebuilding efforts. After the presentation there will be time for Q&A. The Forum will be moderated by Dr Sangsoo Lee, Head of the ISDP Stockholm Korea Center. Jae-Seung Lee is Professor and Jean Monnet Chair in the Division of International Studies and Director of Nordic-Benelux Center at Korea University. He has also served as Policy Advisor to the Foreign Ministry of South Korea and Chairman of Asia-Europe Energy Policy Research Network (AEEPRN). Prof. Lee has authored a number of books and articles on regional cooperation, energy security and South Korea’s foreign policy. Prof. Lee holds a B.A. in political science from Seoul National University, M.A. and Ph.D. in political science from Yale University. He joined Johns Hopkins University-SAIS (2015-16) and Stanford University (2011-12) as a visiting scholar. He has contributed op-ed articles to major Korean newspapers and has commented on international affairs for the BBC, CNN and Korean broadcast stations.